﻿I’m a member of a fabulous on-line writing group called Backspace. Many of our members are published authors, and I made an offer to them. Write a guest blog, on (almost) any topic you like, and I’ll post a link to their book(s) in the side panel. Most of the world celebrates May 1 as a holiday for workers, whether it’s called Labor Day, International Workers’ Day, or simply May Day. Why has the United States chosen to relegate the holiday to obscurity, primarily by celebrating something similar in September? You won’t learn about May Day in an American school. Why not? Because here is where it began. In the U.S. they decided to have Labor Day in September, in an effort to dissociate the holiday from the events in the Haymarket, Chicago, 1886. International Workers Day is rarely mentioned in the U.S. media. Railroad Man, the Legend of Lil’ Jay, will be released May 1, 2011 in Chicago. The reason for the date and location of the release becomes clear when you read Chapter 6, The Haymarket. Railroad Man is the biography of a modern-day hobo with ties to the Wobblies, the Industrial Workers of the World, and in the course of Jay’s story, the reader will learn a little bit about the struggle for the eight-hour workday, and the men and women who gave their lives for the cause. Here’s a bit of background on the Haymarket in an excerpt from Chapter 6. Unions gained strength in the mid 1800s. Working conditions were harsh, hours were long, pay was low. Business owners grew wealthy at the expense of workers. Saturday, May 1, 1886 was the deadline for the eight-hour workday. If labor bosses didn’t shorten the workday to eight hours, workers across the country would strike. Chicago proved to be the epicenter of the quake heard round the world. May 1st, in city after city thousands of workers rallied and marched for the cause. A half million workers protested with one voice, loud enough to finally be heard. Albert Parsons led a march of 80,000 workers down Michigan Avenue in Chicago. Monday, May 3, 1886, McCormick Harvesting Machine Company strikers harassed scabs who crossed picket lines. August Spies led the group and encouraged them to remain peaceful and united. The police stood by and when a confrontation erupted they opened fire, killing six workers in an attempt to intimidate anyone bold enough to take a stand against big business. But the movement would not be stopped. The next day they quickly planned a rally at the Haymarket Square, at Randolph Street and Des Plaines. Albert Parsons, August Spies, Adolph Fischer and others took turns addressing the crowd of hundreds that evening. The speakers encouraged the workers to remain peaceful, but to hold their position for the eight-hour workday. Nearby a large group of police officers waited for confrontation. Toward the end of the talks a light rain began and most of the crowd dispersed peacefully. If strikers could be made to look like troublemakers in the eyes of the country, the businesses would appear justified in refusing to meet their demands. Therefore, it suited the interests of businesses to assure the strikers came out looking like the troublemakers. And so far this evening, they were looking completely peaceful. Someone wanted that to change. Reports said police charged the dwindling crowd and someone threw a pipe bomb, killing Officer Mathias Degan. The identity of the bomb-thrower was never established, but logic pointed to someone with reason to start a riot where none existed. The police responded by opening fire, mainly at each other. Was it too dark or did they realize the side with the most injuries would be the side with the most sympathy in the eyes of the public? Seven policemen and four workers were killed. The news media had the fodder it needed to denounce the strikers. Across the country and around the world Chicago became the focus of the workers’ rights movement. The media exaggerated the incident and called for revenge. The bomb-thrower was never identified, and that suited the purpose of the business owners, the police and the media. Blame those who led the movement. Hang them all and hopefully the leaderless workers would humbly go back to work. The infamous trial was held mainly in the media; the jury was the American public. Eight men were found guilty of Degan’s murder. They appealed to the Supreme Court of Illinois, and then to the United States Supreme Court but the public outcry was for hanging and the U.S. Supreme Court refused to hear the case. One man was sentenced to 15 years in prison; the remaining seven were sentenced to death by hanging Friday, November 11, 1887. The day before the hanging the governor commuted the sentences of two men to life in prison. The night before the hanging another one died in his prison cell of questionable cause. Black Friday, November 11, 1887, August Spies, Adolph Fisher, Albert Parsons and George Engel were publicly hung. 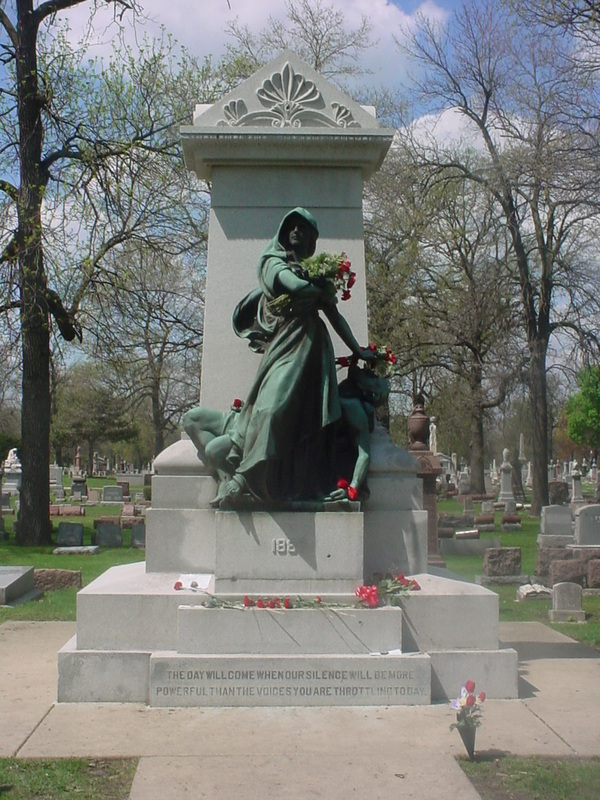 June 25, 1893 the Haymarket Martyrs’ Monument was dedicated in Waldheim Cemetery outside Chicago to commemorate Spies, Fischer, Parsons, Lingg and Engel. The next day then-Governor John Altgeld granted a full pardon to the three living defendants, Schwab, Fielden and Neebe who had spent nearly six years in prison for a murder they did not commit. And the American working class earned the eight-hour workday. Today, at the entrance to the cemetery (now called Forest Home Cemetery), a small sign points to the Haymarket Martyr’s Monument, the most famous in the cemetery. The towering memorial features two bronze figures, a woman representing Justice standing with a determined look on her face, ready to draw her sword to protect the fallen worker behind her. May 1, 2011 will be the 125th anniversary of the strike that led to the standard eight-hour workday, now recognized around the world. The Illinois Labor History Society is restoring the Monument in time for the celebration. See their site at www.IllinoisLaborHistory.org. 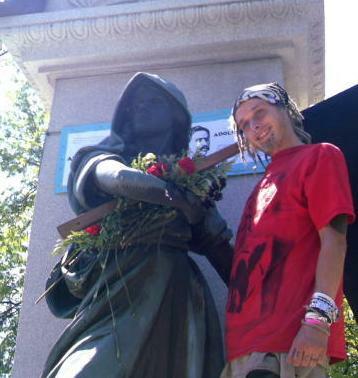 In connection with May Day 2011, Railroad Man, The Legend of Lil’ Jay will be released at a celebration in Chicago, Illinois. Jay would be happy to know he is remembered, and he would be thrilled to know his life story will forever be connected to the workers who fought and died for their beliefs, beliefs Jay championed.